When one thinks of the musical centers of New Zealand, the city of Tauranga doesn’t have as celebrated a history as Dunedin, Auckland or Christchurch. Which is apt, in a way, as the artist known to us only as Rotate The Completor makes music that sounds unconnected to any scene in NZ or elsewhere. A chance encounter with an enthusiastic passerby while busking on the streets led to the receipt of a home-recorded cassette, which caught the ears of the outsider music community, although any attempts at personal correspondence with its creator from his new admirers went ignored. Armed with a guitar, kick-drum, and vocal stylings which wouldn’t sound out of place on an early Residents record, Rotate The Completors: Completed Rotations Of The… is the sound of a one-man band playing at a carnival that’s gone off the rails. RTC’s other- / inner-wordly songs are a strangely addicting brew of low-fi bedroom pop, proggy loner folk and bouncy children’s music, with such lyrical concerns as beer-stealing cantaloupes, dead albino hedgehogs, and emphatic denials of insanity. 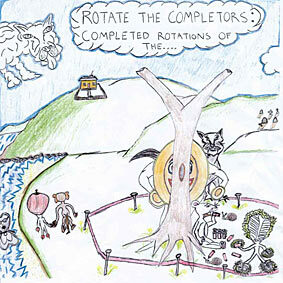 Roaratorio is proud to present Rotate The Completors: Completed Rotations Of The…, newly mastered for vinyl, to a wider audience for the first time. Download coupon included. “…Don’t write this off as some product of naive charm, though. In his own eccentric way, RTC can actually play the guitar like a whizz, he’s simply (through a heroic effort of mental splitting, perhaps) pretending that he can’t. He can perform quite intricate and complex melodies, and repeat them, with obvious facility; matter of fact his guitar can often double up the wayward melodies his voice is warbling, as though he were a deformed version of a seasoned be-bop player from the 1940s. In short there is real skill hidden behind a loonish mask of antic disposition. The first songs on the album do resemble some demented variant of home-made rockabilly, but his swell guitar licks soon broaden out into more adventurous areas, played strangely but always with articulation and feeling. The fifth song on Side A (there are no titles we can usefully apply to the situation; buy a copy and you’ll see what I mean) does indeed resemble moments from the most glorious LP of “lost” psychedelic music from the Japanese underground of 1970s. Then on the next track we might find bursts of jazz-tinged riffing, followed by a song enhanced with chordal strums that yield rich plangent patterns. The music is all over the place. This record may feel like a bedroom tape crossed with an odd LP of children’s songs, but RTC might just be New Zealand’s answer to Eugene Chadbourne.